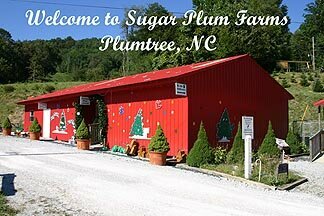 Discover Sugar Plum Farms. You will find it to be the choose and cut tree farm that you have been looking for. We are located off highway 19-E near Plumtree, North Carolina. We are 12 miles North of Spruce Pine and 12 miles South of Elk Park. We are 2 miles off highway 19-E on Isaacs Branch Road, on top of Little Elk Mountain in beautiful Avery County, North Carolina. We have signs on highway 19-E to show you the way to our farm. Come and bring the whole family and stay awhile. See our map, print and bring it with you. We have all sizes of North Carolina Fraser fir trees to choose from. We furnish the saw to cut your tree or we will cut it for you and we will bail the tree. We will load and tie down your tree to insure a safe trip home for you and your tree. Wreaths, garland, and other greenery items are available. Bring the whole family and take a hayride to pick the perfect North Carolina Fraser fir Christmas tree. We have picnic tables around a pond and small animals (ducks, farm dog, etc.). Apple cider, hot chocolate and coffee along with other drinks and souvenirs will be provided at no extra cost. We have home made apple butter and honey for sale. Trout fishing in our pond is extra. You can take a picture of your family cutting your Christmas tree for you to take with you. Picturs can be made free of charge with Santa and the elfs. There are numerous photo opportunities available. Restrooms are available on the farm. Starting the weekend beforeThanksgiving (November 18 & 19) we are open 9 am to 4:30 pm. Thanksgiving Day, Friday, Saturday and Sunday, 9:00 am to 4:30 PM. Weekdays other than above we are open 12:30 to 4:30 PM. 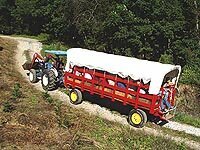 We accept tour groups by appointment. Groups can have meals catered with your choice of menu. Please arrive by 4:00 p.m. so you can pick out your tree before dark. We will be open through December 20th. 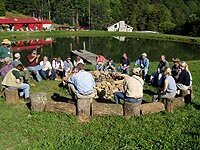 We are a member of the Avery County Christmas Tree and Nurserymen Association, North Carolina Christmas Tree Association, National Christmas Tree Associations and North Carolina Goodness Grows Association. Our quality keeps our customers coming back year after year. Before leaving you will have a chance to visit and browse our Christmas Shop. Enter our tree contest for a free tree next year. When you finish breakfast, come to the farm, enjoy hot apple cider, hot chocolate or coffee with other snacks. Then go pick your perfect North Carolina Fraser Fir Christmas Tree from about 10,000 trees of all sizes. After you have picked the tree of your choice, you can cut it or we will cut it for you. The tree will be bailed and tied securely on your vehicle. Then the fun continues with a hayride to the top of our mountain where you can see a breathtaking view of many different mountain tops and valleys. You can also see how we produce the perfect Christmas tree for you. When you return, you can browse the Christmas Shop to find the perfect Gift or Tree Ornament for your perfect Christmas tree. You will also receive a free souvenir to take home. We have nice new restrooms, picnic tables around a pond and plenty of parking. Don't forget to enter a contest for a free tree next year! We want this to be a family trip for you for many years to come. Stay out of the high traffic areas. Come enjoy the mountain country side. We promise you won't be disappointed with Sugar Plum Farm.